• Conventional deadlifts require a lot of ankle, hip, and knee flexibility. Squat stance or sumo stance deadlift may be a better option for people who struggle with mobility at these joint sites. 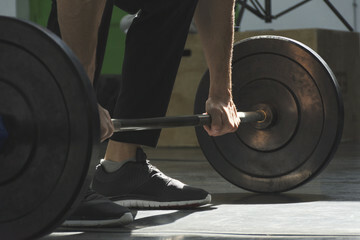 A good way to tell which is best for you is if at the start you can keep the barbell over your laces while your armpits rest directly over the barbell. • In order to create a wedge and build tension before the first pull, your elbows must be locked out. If elbows are bent at the start you will end up jerking the barbell off the floor and all the tension in your back will be lost. Rounding at the back increases the risk of lower back injury and you will not be able to lift as much weight. • Shooting your hips up too early will take your legs out of the lift and you will lose your tension and positioning. This will place all that weight onto your lower back which is no bueno. So… BE PATIENT! • The further the barbell is from your body the less efficient you will be throughout your lift. Providing some sort of feedback might help a little more than just saying “keep the bar close.” Add some band resistance to the barbell so you can feel what muscles are needed in order to be more efficient throughout your lift. • Please, please, please, avoid crashing down to the floor at the bottom of your lift because it is just not safe! Plus, bouncing the barbell off the floor cheats the first few inches of the lift (which are the hardest). Your rep scheme should affect which technique you use. Six reps or higher, I would use a touch and go approach with a light touch to the floor at the bottom before coming back up. Five or less reps, I would use a dead start approach. Dead starts allow you to reset back, shoulder, and grip tension at the bottom before each repetition. • A lot of people will push their hips forward at the end of the deadlift instead of stopping when their body forms a straight line. Pushing the hips forward will arch the lower back and over time can lead to lower back pain or injury. Instead of thinking about thrusting forward, think about projecting your energy downwards with the feet and squeeze the glutes at the top. I hope this helps and if you have any questions or are wondering what deadlift is best for you, feel free to come find me or email me at Becca@forge-rx.com. Happy Training.